NaturallyCurly: Introduce yourself and your event. 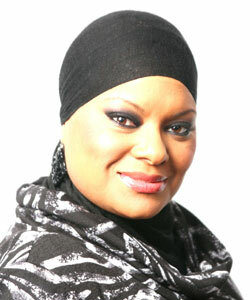 Luvina Sabree: My name is Luvina Sabree and I am the organizer of the Armed Forces Natural Hair and Health Expo. I am also the organizer of Killeen’s Happy 2 B Nappy and Killeen’s Natural Hair Groups. I will host two expos this year: San Antonio’s FIRST EVER Natural hair expo, September 2, 2012 and in Killeen we will celebrate 7 years of Natural Hair Day (NHD) and our second Natural Hair Expo. NC: Can you tell me a little bit about yourself and how you got started in the hair care business? LS: I was one of the members that attended NHD since its inception back in 2005 at Under One Roof Bookstore here in Killeen. When the store closed in 2007, I moved NHD to my home. I also added a couple of components to serve holistically. I added making your own products and eating organically. NC: Can you tell me a little bit about your own personal background and the event’s background? LS: I am happily married to a retired soldier and we have six children, five that I homeschool, and the other in college. Professionally I am a RN. I also have my own bath, body, and hair product business. I am also a Licensed Texas Hair Braider. The event started with me attending a natural hair workshop. I was so inspired with the information that Malaika Tamu-Cooper offered, I wanted to share it with my community here in Killeen. From that point on I started preparing for our first expo. Our first natural hair expo was a success! I was asked several times how long I had been doing expos, and I realized that I had something great to share. I gravitated to wanting to share information on natural hair and health with all military members, their families and their local communities across the country. NC: How do you wear your hair? Natural? Curly? LS: I have been natural for about nine years for the second time around. I have what are called braid locs. Before I locked my hair, it was mid back length (mbl), and due to shrinkage, it's now past my shoulders. NC: Can you tell me about your curly hair story? LS: I became natural while I was in nursing school in 1995. I had worn it in a ponytail daily and just decided to cut it off. It did not bother me at all. Cutting off my hair did have an effect on some people in my circle. Being natural was not as popular back then as it is now. In 2002, I decided to have it straightened and liked it. For some reason, I had lost my mind and decided to get a relaxer. Soon thereafter, I found my mind and had many regrets. As soon as I grew enough new growth to wear a fade cut I did. Over the years it has grown. My mother wanted to have locs really bad but did not want to experience on her own. I promised her that if she gets locs, I will get them too. I enjoy the versatility and never having to use a comb. NC: Let’s talk a bit about the event: when, where, cost to enter, type of vendors, how often etc? LS: The Armed Forces Natural Hair and Health Expo San Antonio will take place on September 2, 2012 from 11am – 7 pm, at the Norris Conference Center (4522 Fredericksburg Rd, San Antonio, TX 78201). Tickets are $15 in advance and $20 at the door. 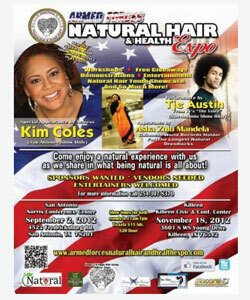 The Armed Forces Natural Hair and Health Expo Killeen will take place on November 18, 2012 from 11 am – 7 pm, at the Killeen Civic and Conference Center (3601 S WS Young Dr., Killeen, TX) 76542, $15 in advance and $20 at the door. The show will commence yearly. We have vendors that offered natural hair products, real estate and everything in between. Our attendees were excited about the variety of vendors available to them. NC: What can attendees expect to see and experience at the event? LS: Actress Kim Coles will make her first Natural hair show appearance in Texas and Tje Austin from TV’s “The Voice” will perform at the San Antonio expo. Asha Zulu Mandela, Guinness World Record Holder for the Longest Natural Dreadlocks, will make an appearance at the San Antonio and Killeen expos. Both expos will also feature workshops on natural hair and health, entertainment, a natural hair fashion showcase for children and adults, free giveaways and one of the largest product swaps. NC: How does your event differ from other events happening in the community? LS: Our event is different because of the audience that we cater too and it is the first of its kind. I am a veteran and my husband is retired from the Army and our hearts are with military and their families. Due to the diversity of the military families, we are able touch many. We cater to the military, government officials, their families and the local community surrounding the military bases. NC: Anything else you would like to add? LS: Our goal is to start here in Texas and expand globally educating military families, and the local community about natural hair, curly hair and health. NC: Tell us where we can connect with your brand. LS: To find out more about the event, you can visit the website for the event: www.armedforcesnaturalhairandhealthexpo.com, Facebook and Twitter. To connect with Killeen’s Happy 2 B Nappy Hair Group visit Facebook. NC: Lastly, what’s your opinion on the texture revolution. Do you see it becoming a bigger trend/movement? In Hollywood? In real life? LS: The texture revolution is simply the beginning to realizing the beauty and power that we have within ourselves. With the texture revolution, people are learning to love yourself as you are — no chemicals needed. With increasing awareness, the texture revolution will become more than a trend or a movement. It will simply become a way of life. In Hollywood, you can already see celebrities celebrating their natural beauty. Stars such as Kim Coles, Solange Knowles, and Nicole Parker are showcasing their natural hair on the red carpet. In communities across the country, people are starting to realize the negative repercussions that chemically treating your hair can have on the body. There are natural hair groups in many major cities and little towns and it’s all because people are finally educating themselves and loving themselves for who they truly are.